The Della Robbia ceramics are a type of maiolica bas-reliefs created by a Florentine family of sculptors. 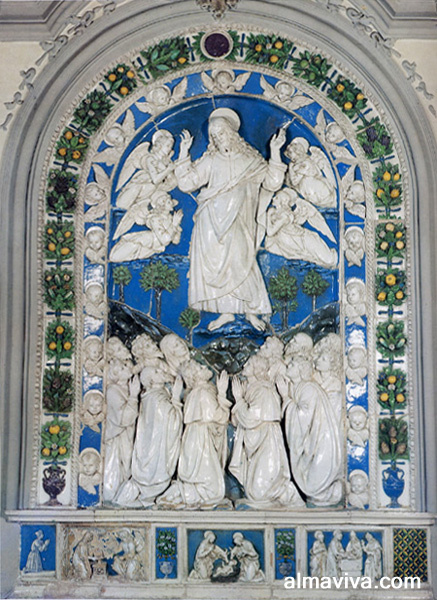 Luca Della Robbia (around 1400-1482) is the founder of the atelier. He perfected a process for making clay reliefs and figures permanent by glazing them. Originally, these were figures on a blue background. His medallions and reliefs of the Madonna and Child are especially notable. He later added glazes of many colours, especially green and yellow, to the bas-reliefs, usually with a wreath of fruit and flowers surrounding the figures. 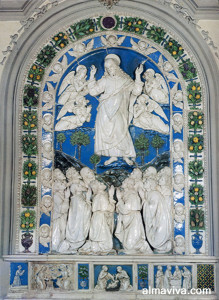 Many of the Della Robbia terra-cottas are still in their original settings on buildings in Florence and Siena.